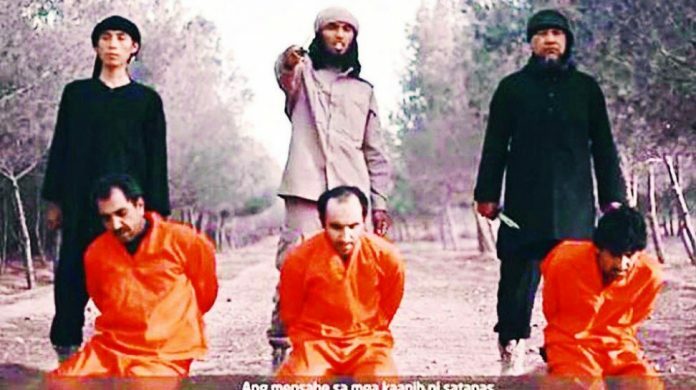 The sick beheading video featuring Filipino Mohammad Reza Lahaman Kiram (centre). The UN and the US government have blacklisted a Filipino and two other Southeast Asian men who appeared in an Islamic State beheading video. Mohammad Reza Lahaman Kiram, aged 28 from Zamboanga City, is now “subject to assets freeze, travel ban and arms embargo”, the UN said in a press release yesterday (Friday, August 24). Kiram is believed to have travelled to Syria with his wife and daughter in 2015. He was seen in a 2016 IS video beheading captives. He has also been linked to a bus bombing in Zamboanga City in 2012. The UN said Kiram was now a senior member of IS, along with Malaysian Mohamad Rafi Udin and Indonesian Mohammed Karim Yusop Faiz, who have also been sanctioned. The two were also featured in a beheading video and had undertaken recruitment activities, the UN and the US government said. In placing them on its sanctions list, the UN also mandates all member states, including the Philippines, to “expeditiously exchange information ” on the terrorists, freeze their assets, deny them access to the international financial system, and prohibit their travel or relocation. In a press release yesterday, the US Department of the Treasury’s Office of Foreign Assets Control placed the three on its list of “Specially Designated Global Terrorists”. “As a result of today’s action, all property and interests in property of Udin, Faiz, and Karim subject to US jurisdiction are blocked, and US persons are generally prohibited from engaging in transactions with them,” Sigal Mandelker, treasury undersecretary for Terrorism and Financial Intelligence, said in a statement. The three now join thousands of individuals, including Filipinos, on the UN and US anti-terror blacklists. Earlier this year, they blacklisted Abdulpatta Escalon Abubakar, who is believed to have followed orders from slain terrorist leader Isnilon Hapilon. Hapilon, an Abu Sayyaf leader who pledged allegiance to IS in 2016 and became the group’s ‘emir’ in Southeast Asia, was killed during the siege of Marawi City last October. As we reported in March, his replacement has been named as militant Abu Dhar.